It is a fact that there are more mobile phones in the United Kingdom than people and this has been true for a couple of years. Added to this, the latest figures produced by the International Telecommunications Union confirm that at the end of 2006, there were almost 2.7 billion mobile subscribers globally or alternatively, 41% of the world’s population now own a mobile phone. Indeed having just read this figure you can be fairly sure that it has already increased. No other communications technology has achieved this level of penetration and certainly, no other technology has made its impact so rapidly. The usage of mobiles is equally staggering. On New Years Day 2007, a new record was set for the number of SMS text messages sent over the UK’s mobile networks. How many? An amazing 214 million; in just one day! That’s the equivalent of approximately 9 million per hour or just over 3 for every man, woman and child living in the UK. So why therefore am I writing an article about the history of a technology that is in widespread everyday use, is still evolving and is regarded as new by those that use it? Well, that is precisely the point. The mobile phone industry is moving forward so quickly and is so obsessed with tomorrow’s device that the heritage is being forgotten. There are more websites devoted to the good old GPO 700 series rotary dial telephone than to the history of mobile phones. Even major manufacturers like Nokia and Motorola seem to be ignoring the rich legacy and heritage that their products represent. Through my article I wish to make a small contribution to addressing this issue. The story of the development of the mobile will be told and illustrated throughout by examples of phones taken from part of the collection we maintain at the University of Salford. The design of the first products that resemble today’s mobile phone started with Motorola and their pioneering work that led to the launch of the walkie-talkie, epitomised by the SCR536 used by the American Military in World War Two. Using radio within vehicles had been established before this and that technology was adapted by Bell Laboratories who, in 1946, demonstrated in the USA the first radio telephone call from a car. By 1948 the service was delivering 30,000 calls per week. There were many limitations and one of the most serious was how to assign enough different frequencies to handle the volume of traffic demand. This was solved by DH Ring and WR Young who in December 1947 published a Bell Laboratories’ article entitled “Mobile Telephony – Wide Area Coverage”. Here they proposed the concept of a cellular network in which the country could be divided up into small regions – cells – and that frequencies could be re-used within cells providing they were not adjacent. It did of course mean that as a customer moves within the network so their telephone call needed to be passed from one cell to another with the frequency in use having to be changed. However, it was not until 1974 that the Federal Communications Commission (FCC) in the USA released part of the radiofrequency spectrum for experimental cellular communication. In 1977 Illinois Bell installed the first cellular telephone network comprising 10 base stations (cells). This was aimed at subscribers who had radio telephones in their cars and indeed many have speculated that the USA was so focused on car phones that they fell behind many of the advances made within Europe. It was the Scandinavian countries and particularly Sweden that led the way. Working in collaboration with Denmark, Norway and Finland, the Nordic Mobile Telephone (NMT) system was agreed and launched in 1981. This common standard and a collective view that mobile networks were a strategic asset gave them an early lead and by 1987 it was reported that 2% of the Nordic population were subscribers. In the UK, the early 1980s were dominated with the re-structuring of the GPO and the creation of British Telecom. The Government announced the establishment of two licences for mobile phone operations. One would go to British Telecom and Securicor and became known as Cellnet. The other was awarded to a joint venture between Racal Electronics and Millicom and this became Vodaphone (VOice and DAta over the telePHONE) in 1983. When Cellnet launched their service in 1985 there was just one base station, sited on top of the BT Tower in London, covering the whole Greater London area. In the Far East the development of the mobile was led by Japan who in 1979 launched their first network operated by Nippon Telephone and Telegraph. All of these early systems used analogue technology operating at 800Mhz and based on the American Advanced Mobile Phone System (AMPS) or the Motorola derivative, Total Access Communication System (TACS). This latter version was known as ETACS in Europe and JTACS in Japan. Each call was allocated a separate frequency which had major implications on bandwidth allocation. Some early examples of these first generation analogue mobiles were the Motorola 4500X and Panasonic EBJ-1114. Developed from earlier car mounted examples these became the first hand portables but you had to be strong to carry them and whilst portable and mobile, they could not be described as convenient or appropriate for the mass market. Retailing at several thousand pounds each, early adoption came from the business community. In the USA, Motorola were about to revolutionise the mobile and set a new standard. The Motorola Dynamic Adaptive Total Area Coverage (DynaTAC) 8000X changed everything. Dr Martin Cooper and Rudy Krolopp introduced the world’s first truly hand-held cellular phone. It was the culmination of fifteen years research and $100 million of investment but it became a classic and was the main driving force behind the expansion of the mobile in America. The DynaTAC is represented in this article by two examples. The Motorola 8500X was introduced in 1987 becoming extremely popular in Europe and the most commonly found handset in the UK at that time. The Ultra Classic was the last in the line of these analogue ‘brick’ phones and although noticeably slimmer than the 8500X it still weighed 600g, cost £2,500 to buy and had a battery life of some 8 hours (standby). If the mobile phone was to make a real impact with the general public then two things had to happen. Firstly, it had to get smaller and secondly, it had to become cheaper. In 1989 Motorola once again redefined the face of the mobile phone with the launch of the MicroTAC. Weighing 340g and measuring 172 x 57 x 32 mm it may be regarded as very heavy and big by today’s standards but in 1989 it was simply amazingly light and small. It also introduced the concept of the ‘flip phone’ where a moveable plate covered and revealed part of the keypad. The small hole in the flip plate which gave the impression of it being the microphone was in fact false. The microphone remained firmly within the main body of the phone and the flip plate was entirely cosmetic. So too was the extending aerial. This was a piece of plastic but was included because market research had revealed that the public expected the phone to have an external aerial. In reality the MicroTAC had an internal aerial. An interesting and iconic mobile that made some attempt to challenge the dominance of Motorola was the Sony CM-H333 or ‘Mars Bar’ phone. This analogue phone was released in 1993 and became one of the most desirable handsets of its time. It had a sliding earpiece that moved up and down to answer and end calls. Another design by Sony, the CM-R111 achieved further levels of miniaturisation by removing the screen. Also released in 1993 it measured just 64.2 x 85.5 x 24.4 mm, had a flip down stick microphone and was designed to work on the UK ETACS network. The launch of GSM and the continued advances in integrated circuit and battery technology led to a plethora of new mobile handsets. The Nokia 101 was the first of the so called ‘candy bar’ phones, being the shape of a bar of chocolate. Compared to Motorola’s preference for flip phones, the 101 was to define the standard shape of Nokia phones to this day. Launched in 1992 it weighed 475g and offered 12 hours of standby battery power and 1 hour of talk time. Motorola moved into GSM with its 5200 MicroTAC which had the same familiar look of the earlier generation analogue phones. 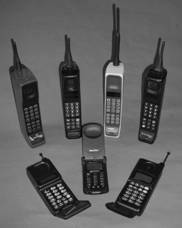 In 1996 Motorola introduced yet another classic, the StarTAC, which became the world’s first ‘clamshell’ phone. Marketed as a ‘ready to wear accessory’ a clamshell design differs from a flip phone by virtue of the fact that it folds completely in half like the type of mollusc from which it gets its name; the flip only covers part of the phone. The StarTAC was also the world’s smallest and lightest (88g) mobile of its day offering 4 hours of continuous talk time, 47 hours of standby battery power and a vibrating ringer. With the continued growth in subscribers more and more manufacturers entered the handset market. Three examples are included to represent this period of expansion. The NEC G9 and Philips TCD308 ‘Diga’ were both introduced in 1997 and the Alcatel One Touch Easy became available in 1998. Whilst these all differed in size and battery life they offered a similar range of functions. The Alcatel was interesting however, for it worked on standard AAA batteries. A further reduction in size was achieved by moving from the credit card sized SIM card (Subscriber Identity Module) to the now standard miniature SIM (25 x 15 x 0.76mm). The Motorola g520 was the first in their range to make this change and as a result its width was reduced by some 10mm compared to previous models. The big challenge for the industry now was how to make your mobile more attractive than a whole range of alternatives that offered similar functionality. It is at this time that the mobile truly starts to become a fashion item with increased levels of personalisation. The Nokia 3210 was the first mobile to offer changeable covers. It also allowed you to customise its ring tone, had predictive text to make typing SMS messages easier and came with built-in games. It was introduced in 1999, weighed 151g and had a battery that offered 260 hours of standby time and 3 hours of talk time. The Ericsson T28s is also worth a mention at this point as an example of increased miniaturisation. Weighing just 83g and measuring 97 x 50 x 15mm it was an ultra small flip phone. By the mid 1990s the Internet, thanks to the creation of the World-Wide-Web, was starting to become a serious mass market communications medium and information resource. This fuelled a drive towards further levels of data and voice integration and that in turn culminated in the launch of the General Packet Radio Service (GPRS) in 2001. The GPRS is a packet-switched technology which allowed multiple users to share the same bandwidth, transmitting only when they have data to send. This new ‘always-on’ service offered data rates of 30 to 40kbps and opened the way for mobiles to access the Internet and other data services. It created the next generation of mobile network which became known as 2.5G. Protocols such as the Wireless Application Protocol (WAP) allowed websites to be viewed on mobiles and a new era of mobile commerce (m-commerce) was heralded. Sadly, like many predictions at this time such as the dot.com boom, WAP has never truly lived up to all of its hype. Nokia were quick to respond to the new network and created one of the most successful mobiles of all time, the 6310. It provided support for GPRS and WAP and was one of the first to include a new form of communications interface using Bluetooth 1.1. Despite the clear success of GSM and now GPRS, there remained one problem that limited global roaming. Not all countries supported the full range of frequencies available. Most phones operated in what was known as dual band, being able to communicate within the 900MHz and 1800MHz channels. However, the American market operated on 950MHz and 1900MHz which is sufficiently different to prevent communication. Manufacturers were therefore forced to develop tri-band models that could work in both Europe and America. An example of such a phone is the Motorola tri-band Timeport which was the first GPRS mobile to offer this tri-band compatibility. Another mobile of this generation worthy of mention is the Nokia 7110 otherwise known as the ‘Matrix’ phone. When Keanu Reeves graced the big-screen as Neo in the first instalment of the Matrix trilogy in 1999 he used a Nokia mobile. The huge success of the film led to the launch of the 7110 which offered the same spring loaded slide to reveal the keyboard. It also featured the ‘Navi Roller’ which was a small thumb wheel that allowed easy scrolling through menu options. In 2000 the UK Government concluded its auction for the right to operate 3rd generation mobile networks. Mobile network companies spent a total of £22.5 billion in a bid to be awarded one of these much sought after licences. Is it any wonder therefore that the emergence of 3rd generation networks was slow to materialise? No industry sector can sustain this level of spend and then find the additional money required to invest in the design and construction of the very networks that the licenses permitted them to offer. Nevertheless by December 2005 there were 100 3G networks operating in 40 countries. Based on the Universal Mobile Telecommunications System (UMTS) standard, 3G promises to offer much increased data transfer rates permitting better access to the web, video telephone calls, and the reception of television services. This is not the only 3rd generation technology and indeed the Japanese were the first to launch this new breed of network in 2001. The first 3G mobiles bucked the trend and started to get bigger again. The NEC e808 is now affectionately known as a 3G ‘brick’ phone. Measuring 105 x 80 x 23mm and weighing 200g this clamshell phone was not on the scale of the Motorola DynaTAC but it was a noticeable step up from the 2.5G phones. And so to 2007. With 3G established and growing, the industry is turning its attention to 4G which will offer even greater data rates and a network based on the Internet Protocol (IP) allowing seamless integration across all of our data networks. It has been a mere 30 years since the first cellular network of 10 base stations to the point at which 41% of the global population own a mobile phone. For many though the mobile is a disposable item; something you keep for a year or less and then throw away in favour of the latest offering. It is against this backdrop that the heritage of this important technology is being lost. If through reading this article you have learnt more about how things have evolved and come to appreciate the humble mobile a little more, then I am pleased. Maybe you feel that I have missed out significant examples of phones or wish to add to what I have said. You may even have an old mobile hidden away that you would like to donate to our collection. Whatever your views and levels of interest, I would like to hear from you. Our work at the University of Salford is sponsored by the Engineering and Physical Sciences Research Council and carried out in partnership with the Museum of Science and Industry in Manchester, SETPOINT and BT Connected-Earth.